I hope you decided to join our pink sock monkey craft-along in honor of breast cancer awareness month. If you haven’t started yet, there’s still time to make your monkey! You’ve already met Cupcake, but allow me to introduce her slightly younger sister (only three weeks apart in age, go figure! ), Endura. She’s the monkey you saw being pieced and constructed through much of the craft-along. As a distance runner, the aptly named Endura sports a somewhat shorter ‘do than Cupcake. As a baker, Cupcake prefers her tresses long enough to pull back so they’ll stay out of the batter. Both girls will soon be in new homes. Cupcake is going to a cupcake-obsessed woman fighting breast cancer for the second time, and Endura is going to a runner who is also battling breast cancer. 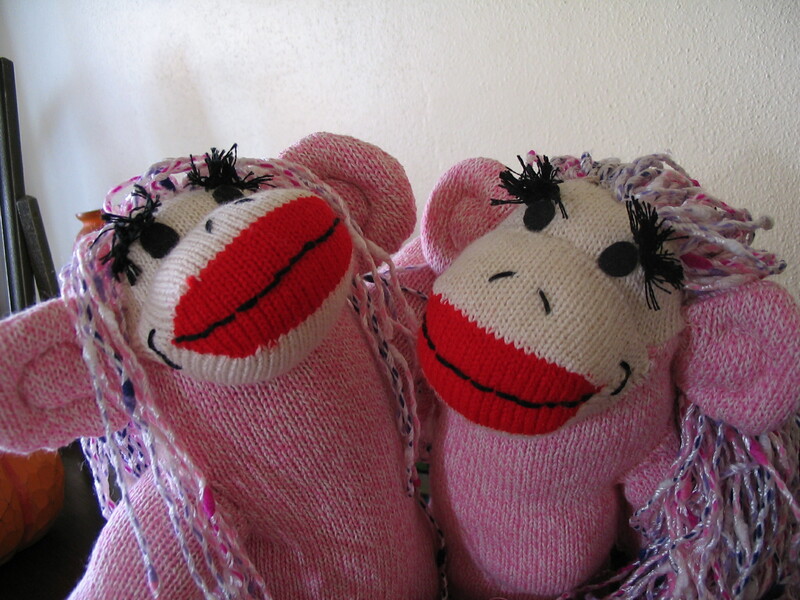 These pink sock monkeys are more than sisters, they share a common bond as cheerleaders against a loathsome disease. How’s your pink sock monkey progressing? 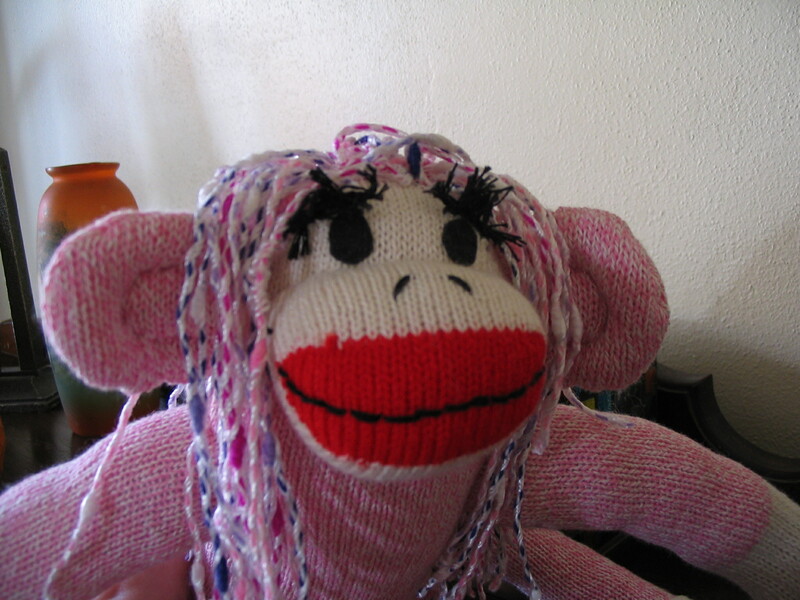 Posted on October 23, 2012, in breast cancer, breast cancer awareness month, craft-along, gifts, pink sock monkey, Projects, sock monkey hair, Sock Monkey wig, Sock Monkeys and tagged breast cancer awareness month, crafts, pink sock monkey, Sock Monkeys. Bookmark the permalink. 6 Comments. Sisters are great. These two share such a strong bond. Lovely work. Thanks for sharing your talent. No side business, please. Even with a high sales price, when materials and factored in, it wouldn’t even pay minimum wage. These sisters are delightful to look at and their mission is divinely inspired. You did such a fantastic job creating them. Thanks, Charlyne. I’m glad to say the girls are one step closer to their new homes, with a pit stop at my sister’s house so she can get them ready to meet their new best friends.